Belize City, Friday, February 7, 2014—Fisheries professionals from member states of the Caribbean Regional Fisheries Mechanism (CRFM) travel to Kingstown in St. Vincent and the Grenadines next week, to take part in a three-day workshop on the development of a CRFM strategy to improve fisheries statistics, data and information, as they also try to resolve capacity challenges confronting Caribbean countries. The event, which will focus centrally on present and emerging fisheries information demands, is a joint collaboration of the CRFM and the United Nations University – Fisheries Training Program (UNU – FTP) in Iceland. It will look at the use of data for economic analysis and fisheries management purposes; the realistic analysis of fisheries data for stock assessment purposes, and future data requirements arising from international markets. Haughton said that they hope to formulate a strategy that countries can agree upon, and use to guide the deployment of their limited human and financial resources in a more strategic and targeted manner. 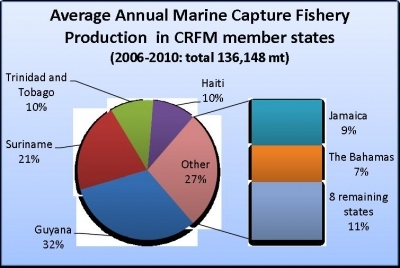 Participants, who will include fisheries experts from CRFM member states, the University of the West Indies (UWI) and the United Nations University in Iceland and Canada, are expected to come up with new strategies and approaches to improve collection, analysis and management of fisheries statistics in the context of the Caribbean Community Common Fisheries Policy, which identifies this as a priority for Caribbean states. The joint workshop is in line with a long-term partnership between the CRFM and the UNU – FTP, aimed at building national and regional capacities for fisheries development and management in the region. The participants are expected to engage in a review and discussion of several relevant activities and reports produced by Caribbean countries. They are also expected to arrive at an agreement on present and emerging fisheries information demands; to make recommendations for appropriate capacity-building options; and to suggest modalities for facilitating the agreed capacity-building schemes.